The Honour Roll was unveiled on the 11th March 1917 in front of a large crowd. The roll contained 112 names of men from the district with a further 20 names to be added. After several stirring speeches by the Colonial Secretary, Mr Colebatch and Mr Harrison M.L.A, the roll was unveiled by two children whose fathers were serving at the front after which a young boy sang "Keep the Home Fires Burning" with the crowd enthusiastically joining in the chorus. The West Australian (Perth), 15th March 1917. 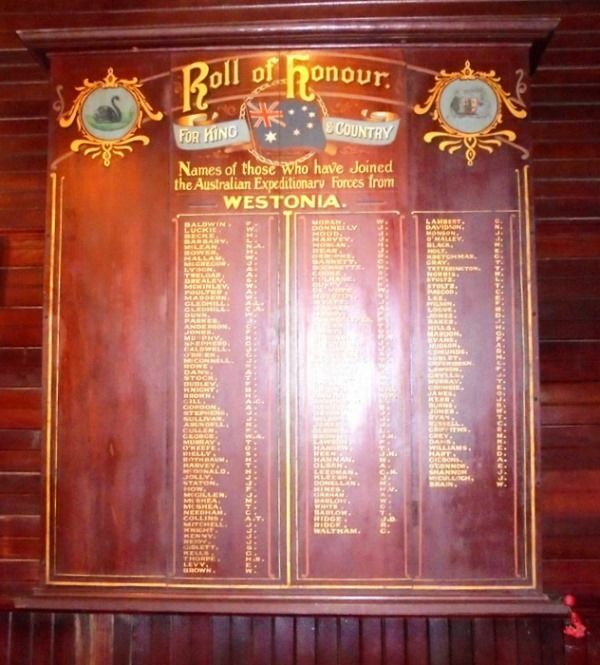 Names of those who have joined the Australian Expeditionary Forces from Westonia.